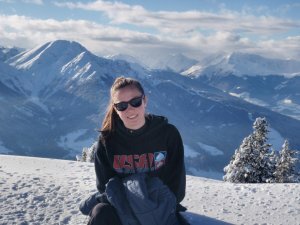 At that point neither Meghan, her family, nor anyone around her had any idea that the Loudoun Valley High teen would find herself today as an Olympic hopeful in the U.S. Skeleton Sliding team. If she does well against her teammate competition this year, Meghan could become one of the three girls on the U.S. team to go to the Olympics in Sochi Russia in February 2014. The winter sliding sport Skeleton is a close cousin to bobsledding, except that, in Skeleton Sliding, a solo contestant lies face down and rides a small sled down a frozen track. Interested by her record in track, the Olympic Committee in 2010 invited Meghan up to the Olympic Training Center in Lake Placid, New York. There Meghan’s combine testing scores were impressive enough to have the committee bring her back the next season. In fall 2011, she was invited back, but she decided to finish out her first semester at Mary Washington. 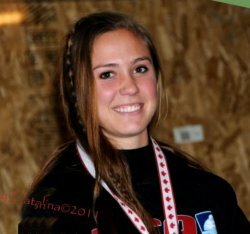 She did participate, however, in the team trials in September, coming up second in the Skeleton “push” trials and making the American Cup Team . (See photo, right.). “That ‘push’ -- that fast start -- is her great strength,” commented Laura Sullivan, her mother. The Sullivan family lives in Bluemont. At 20, she is the youngest member of the women's Skeleton team. And now, in spring semester, Meghan will participate in the Nationals, where members of the U.S. team train and compete against one another. Meghan is living in the Olympic Training Center while taking courses online at Penn State. She plans to take classes year round to keep up her academic progress. Meghan’s blog, “Updates on Ice,” keeps friends and followers up on her adventures http://meghansullivanslider.blogspot.com/.